Use the Automation Integration to connect your Automation Host to your qTest Automated Test Cases. You must install the Automation Host, turn on the Automation Integration and complete the Automation Execution Mapping. This allows you to convert manual Test Cases to automation Test Cases (and vice versa) so that your existing manual Test Cases can be tied to your automation test results. Once you have turned on the Automation Integration setting and completed your Automation Execution Mapping, you are ready to get started. There are multiple ways you can convert your manual qTest Test Cases to automation qTest Test Cases. 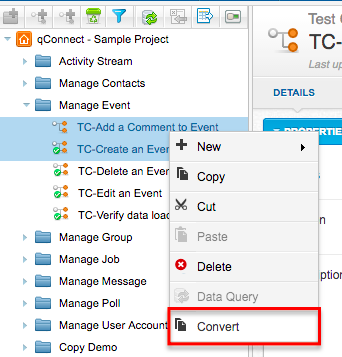 To convert an individual Test Case, select the Convert button on the top left corner of the Test Case Details. You will need to enter the Automation Content, which is the identifier (Test Class, Test Method) that is used to point automation execution results to a Test Run linked to this Test Case. IMPORTANT: Your Automation Content field should be unique when you want to create new test cases and corresponding test runs. If you want to add a test log to an existing test run, then you must match the Automation Content field. Test Design Tree: To convert multiple Test Cases at one time, select multiple Test Cases from the Test Design tree, right-click and then select the Convert option. If a Module is selected, the Convert option is disabled. In the Edit, drop-down select the Batch Convert button. Select the Confirm button to start the converting progress. Optional: If a manual test case is converted to an automated test case, select the Input Automation Content button to fill in the Automation Content for converted Test Cases in this modal. Otherwise, you will enter your Automation Content at the Test Case level. The Automation Content is the identifier (Test Class, Test Method) that is used to point automation execution results to a Test Run linked to this Test Case. Note: Once a manual test case is converted to an automated test case, the icon in the Test Design tree changes from a green dot to a blue dot . Once you have converted your manual test case to an automated test case, refer to the articles here for integrating qTest with your CI/CD solutions.